Richard Hill is an assistant professor in English literature at Chaminade University of Honolulu, Hawaii. Hill’s research examines the production of the illustrations to the novels of Sir Walter Scott, and the influence they had on nineteenth-century illustrated fiction. He is the author of Picturing Scotland through the Waverley Novels: Sir Walter Scott and the Origins of the Victorian Illustrated Novel (Ashgate, 2010). Hill is now working on his next book concerning the lifetime illustrations for the works of Robert Louis Stevenson. Skene confirms his presence at the demolition of the Tolbooth, and his participation in sequestering masonry for Scott. 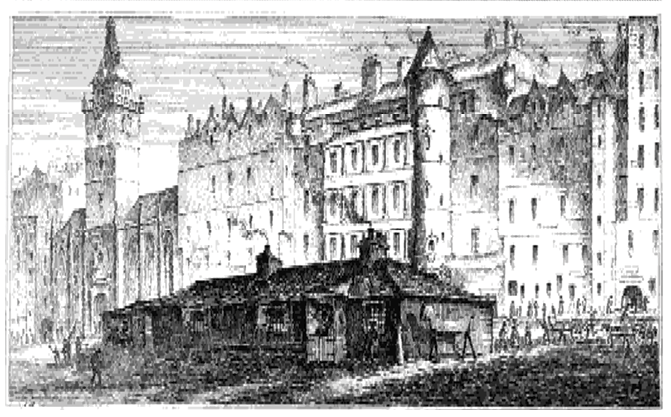 These comments reveal much about Skene’s loyalty to Scott, about their shared interests in Edinburgh’s architectural history and their desire to preserve the memory of the Old Town, and the unusual level of trust Scott placed in his friend to perform errands and favours of personal importance. Skene here acts as an agent for Scott, but he was much more. Skene is a parenthetical figure in Scott scholarship, a friend who helped to design features of Abbotsford as a member of the so-called ‘committee of taste’; however, I contend that Skene plays a much more critical role not only in Scott’s private life, but in the author’s creative processes. I have written elsewhere that Skene supplied visual material in the form of illustrated travel manuscripts which helped Scott to write passages from several of the Waverley novels. Indeed, it is clear that Scott used and trusted his friend to research some of the topography and architecture that appears in the novels. It is the purpose of this paper to further accentuate Skene’s role in Scott’s creative life by outlining the nature of their friendship, and analysing the claims that Skene makes in his Memories of Sir Walter Scott that ‘[m]any of the real localities of the Waverley Novels were connected with my collection of drawings’ (Memories, 157). Finally, Scott’s and Skene’s relationship, in which the artist acts as a research assistant and provides visual stimuli for the author of romances, reveals in part the close, reciprocal relationship of literature and the pictorial arts in the first half of the nineteenth century. Evidence about Scott’s and Skene’s relationship can be obtained from Scott’s correspondence and Journal, John Gibson Lockhart’s Life of Sir Walter Scott, and Skene’s own Memories, which was published by his great-grandson, Basil Thompson in 1909. Thompson makes it clear in his preface that Skene did not want his Memories published during his lifetime, presumably because he did not want to publicise private aspects of Scott’s life while friends and relatives still survived. It is this unusual level of loyalty and genuine altruism that sets Skene apart from many other of Scott’s friends and confederates. Their friendship seems to have been based on a series of shared experiences, values, and interests, which began in the 1790s before Scott became famous. The initial introduction of the two was made over their mutual interest in German literature. Skene, four years Scott’s junior, had what Lockhart called a ‘superior attainment’ of German literature and language, and Scott used him as a consultant while trying to adapt Burger’s Lenore. Skene, it seems, was only too happy to help for no other recompense than friendship and enthusiasm for the subject. This friendship was sealed through their both joining the Light Dragoons in 1797, which had been formed with government approval through fear of French invasion, with Scott and Skene sharing an enthusiasm in their horsemanship. It was during their deployment in Musselburgh in 1806 that Scott and Skene would take riding tours of the local scenery, fuelling the imagery that would appear in the Fourth Canto of Scott’s poem Marmion (1808). This is precisely the relationship that made Skene such a valued friend: unlike so many other regular acquaintances—John Constable, Robert Cadell, James Hogg, William Allan, Lockhart—Skene appears to have had nothing to gain from Scott. He was financially independent, and while he certainly had the talent and opportunity to maximise his privileged position as friend to the Author of Waverley, he does not appear to have had the inclination. Their friendship seems to have been a meeting of minds and temperaments. It was to Skene that Scott turned when struggling through the pain of illness in 1819; and when in 1826 he faced financial ruin, he wrote to Skene directly, who hurried to condole with his friend. Skene goes on to say that, following the scandal of Queen Caroline’s disastrous marriage to George IV, he and Scott had to defend themselves from accusation in society that they had demonstrated ‘malapros adulation’; the two were even ‘taken to task’ by the Duchess of Gordon at a party she gave, and she was ‘not to be pacified’. Skene proclaims his friend’s innocence, but the episode does demonstrate their shared Tory inclinations and social standing (they were, after all, guests at the duchess’s party), and his willingness to defend his friend against libellous accusations. He claims that such a ride to and around Loch Skene provided the imagery to scenes in Old Mortality (1816), and one person they met on another such trip became the character of Tod Gabbie from Guy Mannering (1815). This character, whose real name was Tod Willie, escorted the friends on a fox hunt, at the conclusion of which Willie celebrated with some of his favourite hounds. Witnessing this, Skene says that ‘At Sir Walter’s request I made a drawing of this scene which forms one of the series of “Waverley Localities” ’ (Memories, 35), demonstrating that Skene not only rode with sketch book at hand, but that he was ready to act as a visual record keeper for his friend should an interesting scene present itself. 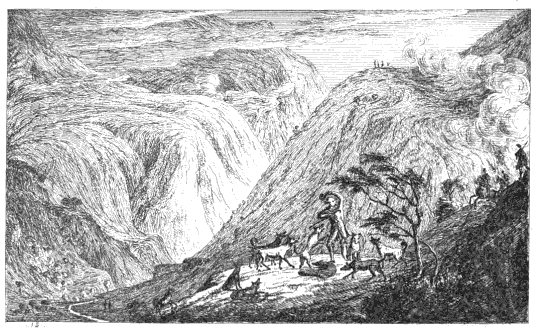 Other such trips included one to Langholm in 1806 to stay with the Duke and Duchess of Buccleuch, during which they witnessed an otter hunt that subsequently made its way into Guy Mannering, and a visit to John Morritt at Rokeby, during which Scott again asked Skene to sketch specifics of the local surroundings. Such excursions put Skene into an important psychological place in the conception of Scott’s work, at least pertaining to their aesthetic development. Both Skene and Lockhart confirm that Scott had never seen the architecture or topography he describes with such authenticity, and although detail can be elaborated through imaginative projection (‘like a black Ethiopian giant’) the visual framework for this elaboration had to remain authentic to the original. In other words, architectural structures and details of real buildings had to be rendered as accurately as possible before the author could then impose artistic interpretation of mood. Such architectural authenticity could only have been achievable through rigorous research and visual aids, such as Skene’s drawings. This is just one example of many demonstrating part of Scott’s technique in achieving authenticity in rendering historical subjects. Visual stimuli—such as paintings, costume books, illustrated travel texts and topographical sketches such as Skene’s—allowed the author to render subjects with as much accuracy as possible. Like Scott, Skene was a keen architectural antiquarian. Skene would become Curator of the Royal Society of Edinburgh, member of the Society of Antiquaries of Scotland and Secretary of the Institution for the Encouragement of the Fine Arts. It therefore should be of little surprise that Scott relied on Skene’s renderings of architecture. As suggested, Skene was consulted regarding some of the architectural features of Abbotsford as a member of the ‘committee of taste’, although it is unclear quite what aspects of the design he was responsible for. He writes that ‘for [Abbotsford’s] expression on paper [Scott] generally applied to my pencil. Much of the architectural detail was supplied by that very clever artist Mr. Blore, who is more conversant with the Gothic style than any professional man in this country’ (Memories, 60). However, Skene also played a design role in the construction of Princes Street Gardens following the draining of the Nor’ Loch. Taking a walk through the Gardens, Scott mentions in his Journal, ‘I question if Europe has such another path. We owe this to the taste of James Skene’. Given Skene’s experience in designing and recording architectural spaces and details, therefore, it would seem reasonable that Scott would rely on his architectural sketches from which to write descriptive passages in the Waverley novels. Skene’s statement demonstrates the level of privilege and trust with which he had been imbued by Scott, who appears to have given his friend a distinct advantage over the English competition by providing the ‘identity of the subjects to be sketched’. The project Skene outlines above—to publish the illustrations ‘simultaneously with each volume’—was not completely fulfilled. Cadell, who was fanatically trying to produce the landmark Magnum Opus edition of the novels with two illustrations to each of the 48 volumes, agreed to publish Skene’s illustrations as a complement edition. Skene’s depictions of the topography and architecture that appeared in the novels would be a suitable visual counterpart to many of the Magnum illustrations, which tended to focus on character and action scenes. However, the heavy burden of designing and etching his own work to tight deadlines proved too much for Skene, who ultimately only produced one of the planned two-volume work of pictures. Little attention has previously been paid to these illustrations, because they appear on first glance to be sub-standard images produced as a favour to a friend as part of Scott’s efforts to squeeze more profit out of his novels. However, these images are significant. They in fact represent in many cases the final expression of visual records of scenes from which Scott produced his descriptive prose. In his ‘Preface’ to A Series of Sketches, Skene makes it clear that the images introduced are authenticated by the presence of the author himself at many of the scenes, which were ‘collected in the course of various interesting excursions, made, many years since, in company with the much-valued friend, under the auspices of whose works it is now proposed to introduce them to notice’. Skene’s Memories include many of these excursions, such as the trip to Langholm that resulted in imagery found in Guy Mannering mentioned above, and an excursion to Loch Skene, which, he claims, resulted in scenery that appeared in Old Mortality: ‘Much of the scenery in the tale of Old Mortality was drawn from the recollection of this day’s ride’ (Memories, 33–34). Most interesting is the recording of scenery Scott witnessed with Skene that has since disappeared, because Skene’s sketches remain as valuable visual records of some of the original scenes in the Waverley novels we can no longer visit for ourselves. One such instance relates to the dwelling of David Ritchie, the real-life model for Sir Edward Mauley, or ‘The Black Dwarf’. 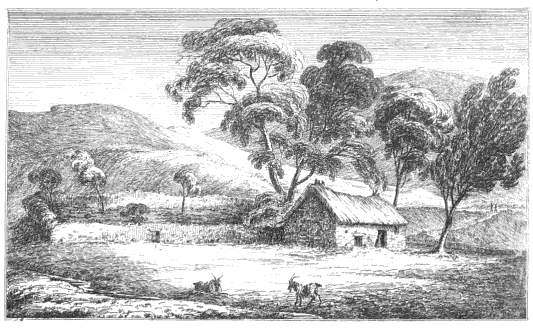 In the introduction to the Magnum edition of The Black Dwarf, Scott reveals that Ritchie was the prototype of Elshie, and that he had visited his reputed home in Peebleshire in 1797. Skene was with him on this trip, and describes the outing in the Memories: ‘We [Skene, Scott, and James Hogg] ascended the Megget and came down the beautiful vale of the Manor Water, where some mention of “Bowed Davie”, and eccentric inhabitant of that quarter, was afterwards elaborated in the fertile imagination of my friend into the interesting romance of the Black Dwarf’ (Memories, 38–39). It is, therefore, interesting to see the scene of ‘The Dwarf’s Hut’ reproduced some thirty-two years later in A Series of Sketches (Figure 2, below). It is possible that Skene produced this picture from memory, but, given the established working practice of Skene sketching scenes on the spot to aid Scott’s memory, it is unlikely. Here, therefore, we see what is likely a worked-up version from an original sketch of David Ritchie’s cottage, taken on the very day in 1797 that Scott laid eyes on it for the first time. Its value to Scott scholarship lies not necessarily in its quality as an etching, but in its recording of a real scene in a real moment in time that directly influenced the inception of one of the Waverley novels. In the absence of photography, this is as close as we will get to such a moment. To have Skene as his primary illustrator made perfect sense for Scott: if Skene was responsible for much of the scenery in the novels, and shared Scott’s aesthetic sensibilities regarding landscape and architecture, then who better to produce illustrations for the texts he had so influenced? Scott had specific requirements of his illustrators. They needed to be respectful of the detail of the source material, specifically of architectural detail, costume, and national-historical topography. Given their history and mutual interests, Skene was the ideal illustrator for Scott. However, Skene could not keep to Scott’s (or rather Cadell’s) strict deadlines, and the engraving work in particular was too onerous for the ‘amateur’ artist. Skene’s failure in this instance is fascinating in itself; Skene was not a professional draughtsman or engraver, and at a time when technological advances in engraving and printing were driving demand for popular illustrated literature higher, Skene, the ‘gentleman artist’, found himself unable to meet demand. He writes, ‘as I was my own engraver as well as draughtsman, the minuteness of the work necessary to bring the scale of the engravings to the size of the novels, made it too severe a strain upon the eyes, so that it was discontinued at the close of the first volume, and the second volume remains unpublished in a manuscript’ (Memories, 160). This ‘failure’ should be seen in the light of the changing nature of artistic production at the end of the 1820s. The illustration of texts was no longer a ‘gentleman’s’ game, it was rapidly becoming a professional, artisan pursuit, and Skene did not fit this mould. This note suggests several things. First, there appears to be a mutual marketing agreement, in which Tilt promotes Skene’s Sketches in return for his help and advice on Landscape Illustrations. Second, it would seem that Skene was an active advisor for Tilt, which in turn hints at the fact that, despite Scott’s resistance to helping the London project in the letter quoted above, Skene’s failure to produce a second volume opened the door for him to be a consultant to Tilt. And finally, it hints at Scott’s guiding hand behind the scenes. If Scott had been so resistant before, he must have acquiesced to Skene helping Tilt by 1831. 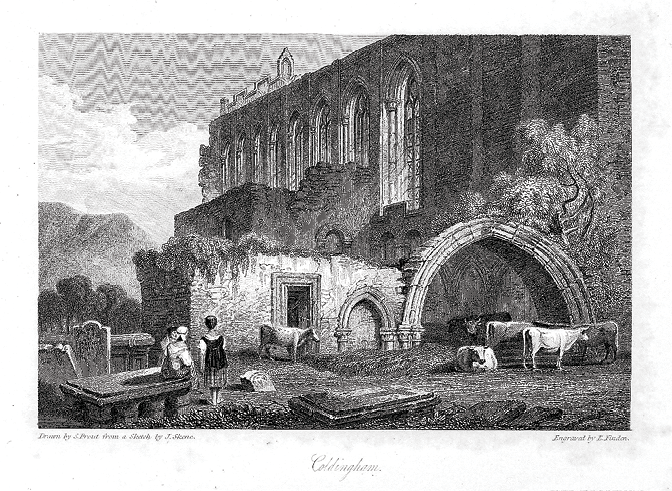 This is confirmed in the Preface to the third edition of Landscape Illustrations in 1833, which states: ‘These Illustrations were undertaken with the knowledge and approbation of Sir Walter Scott; and owe much of their success to the judgement and taste of his accomplished friend, James Skene, Esq., to whom the Editor is under great obligation for considerable aid from his pen and pencil’. In this way, at least Skene’s sketches, which were taken at the request of the author, would help influence the authenticity of the illustrations that were subsequently produced four hundred miles away in London. Scott did not trust his London publishers with the illustration of his works, and turned a blind eye to the practice in silent disapproval of illustrations that represented his prose with generic or lazy images, which conformed to artistic convention rather than observational authenticity; however, it is interesting to note in Landscape Illustrations that several of the illustrations were designed ‘after’ James Skene, including David Ritchie’s cottage, ‘The White Horse Inn’ for Waverley, ‘Craigievar Castle’ for Redgauntlet and ‘Coldringham’ for The Bride of Lammermoor. A juxtaposition of Skene’s picture of ‘Coldringham’ with the subsequent design by Samuel Prout for Landscape Illustrations demonstrates much about the progress being made in London using the new steel-engraving technologies (see Figures 3 and 4 overleaf). The initial contrast of these images reveals an apparent stark contrast between the quality of the engravings: Prout’s later version seems at first glance to be the much more finished, detailed design. It is clearly designed directly after Skene’s original, but Prout has added figures, cattle and minute detail to masonry and foliage to add to the pastoral effect of the image. This is partly to do with the artists’ relative media: where Skene etched his picture, Prout utilised the latest in steel engraving that was being pioneered in London. It is also important to recognise, as Skene does, that Skene was an ‘amateur’ artist, Prout a professional. If anything, these images demonstrate the rapid rate of professionalisation that the engraving trade was undergoing thanks to steel engraving, which allowed a greater level of detail and many more prints from a single plate. The Editor has the pleasure also to know that the task which he undertakes coincides with the wishes of Sir Walter Scott, who is desirous that the illustrations of the pencil may be added to those of the description to render as intelligible as possible the localities on which his fictitious narratives have been founded; and this circumstance ensures the most perfect authenticity to the corresponding relations between the real existing scenes, and their introduction into the Waverley Novels. This disclaimer is almost apologetic, and hints at Skene’s fragile confidence in producing these images for his illustrious friend. However, he rightly points out that he has a stamp of ‘authenticity’ that any other illustrator would lack, because they have been requested by the author himself. It also points to an apparent contradiction: how can the illustrations be ‘authentic’ if the artist has ‘restored’ some of the ruins to their historical period? Hasn’t the artist used his imagination to recreate a scene that isn’t there anymore? This is a contradiction we see elsewhere in the illustrations of Alexander Nasmyth, particularly his ‘reconstruction’ of the Tolbooth, the Old Jail of Edinburgh, which he witnessed being demolished with Scott in 1817. 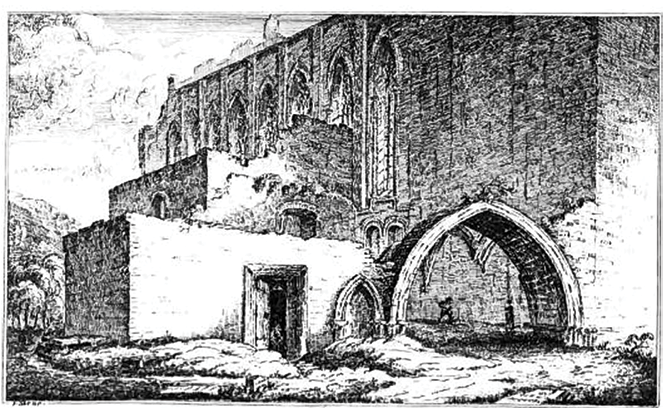 Nasmyth produced three versions of an illustration of the Tolbooth for The Heart of Midlothian, the last of which was designed for Tilt’s Landscape Illustrations. Nasmyth was another artist Scott trusted implicitly with his subject matter, particularly owing to his love and accurate rendering of national-historical architecture; however, like Skene, he was encouraged by Scott to recreate this architecture if it no longer existed in its full state as we see with Skene’s reconstruction of the ‘Guard House’ for The Heart of Midlothian (also destroyed in 1817) (Figure 5). For Scott, this was a means of recording for posterity a visual record of his national architecture within popular culture before it faded from public memory. For Scott, observational accuracy and historical authenticity were not contradictory. During the course of their friendship, Skene became Scott’s ‘aesthetic agent’ for many publishers and artists who sought clarification on subjects and details contained within the novels, as we see with Tilt. Skene was a conduit through whom Scott found he could exert some measure of aesthetic control over the London publishers and illustrators. In other words, artists based in London didn’t need to leave London in order to produce their illustrations, if Skene was able to provide them with sketches. This process was seemingly endorsed by Scott, as he trusted Skene with the kind of authenticity that would not lead English illustrators to render generic or misguided scenery of his native countryside or architecture. The most impressive example of this process involves the great British artist J. M. W. Turner. Scott had been unimpressed by Turner’s mercenary application of his talents when they worked together on the Provincial Antiquities, but in 1824, Scott recruited the artist to illustrate his friend Robert Stevenson’s Account of the Bell Rock Light-House; Skene reveals that the frontispiece illustration of the lighthouse was in fact rendered from one of his architectural sketches. Skene writes that ‘The drawing of the Bell Rock, which Turner painted from a sketch of mine, was certainly a clever performance, but Sir Walter’s prognostic as to the expense was amply fulfilled’ (Memories, 109). Towards the end of Scott’s life, and capitalising on the success of the Magnum, Cadell managed to recruit Turner to illustrate his twelve volumes of collected poetry, which necessitated Turner visiting Scott and Abbotsford to see the scenery for himself. Scott was a reluctant participant, but nonetheless Turner came to Abbotsford in 1831, and Scott made sure that Skene—‘his artist’—was on hand to keep an eye on Turner’s renderings of his beloved landscapes. Even the great Turner, it seems, had to rely on Skene’s eye for detail. Only a very close friend would be trusted with this mission. In conclusion, I find Scott’s friendship with Skene fundamental in understanding how Scott rendered specific topographical and architectural scenes, which so mark his prose style. Skene’s topographical and architectural sketches became the visual framework for much of the romantic scenery and architecture of the Waverley novels. At a time when literature and the fine arts were clearly feeding off each other, we find that an author of romance stories is relying heavily on his artistic friend’s topographical sketches in the process of visualising his material. In fact, both men were interested in the marriage of image and text. Of course, the lasting images from this creative partnership are provided by the written word—Scott’s texts—but due attention must be paid to the manner in which these images were arrived at. In his Memories, Skene makes several claims of influence on the Waverley novels, including the characters of Isaac and Rebecca in Ivanhoe (1820), passages in The Antiquary (1816) and adding the fact that Captain Dalgetty from A Legend of Montrose (1819) was based on an ancestor of Skene’s. None of these claims should necessarily be doubted, but what is most interesting in the cultural climate of the 1810s and 1820s is the fact that Scott seemed to require visual cues to the writing process, and that he really only trusted one person completely with this task. Scott had such a profound influence on subsequent renderings of his native landscape, and on the aesthetics of novel production in the Victorian period, that we should perhaps not overlook the fact that his friendship with Skene—and the creative nature of this relationship—foreshadows some of the more famous collaborations of the Victorian period, including those of Charles Dickens and George Cruikshank (and subsequently Halbot Browne, or ‘Phiz’), Anthony Trollope and John Everett Millais, and Lewis Carroll and John Teniel. Skene would probably not want this attention, and I do not wish to overstate his importance, but there can be little doubt that he does peer out of many of the pages of the Waverley novels. 1. H. J. C. Grierson (ed. ), The Letters of Sir Walter Scott, 12 vols (London: Constable, 1933), IV, 536–37. 2. James Skene, Memories of Sir Walter Scott, ed. by Basil Thompson (London: John Murray, 1909), pp. 98–99. Hereafter, references to this edition will be cited in the main text as Memories. 3. See Richard Hill, Picturing Scotland through the Waverley Novels: Walter Scott and the Origins of the Victorian Illustrated Novel (Farnham and Burlington, VT: Ashgate, 2010), chs 1 and 2. 4. John Gibson Lockhart, The Life of Sir Walter Scott, Bart. (Edinburgh: A. & C. Black, 1871), p. 93. 5. Lockhart, Life of Scott, p. 94. 6. Sir Walter Scott, Marmion, 3rd edn (Edinburgh: Constable, and London: Murray, 1808), IV.1.7–12. 8. Lockhart, Life of Scott, pp. 529–30. 9. Walter Scott, Quentin Durward, ed. by J. H. Alexander and G. A. M. Wood (Edinburgh: EUP, 2001), p. 40. 10. W. E. K. Anderson (ed. ), The Journal of Sir Walter Scott (Oxford: OUP, 1972), p. 559. 11. Letters of Scott, XI, 79. 12. See Hill, Picturing Scotland, p. 36. 13. For detailed discussion of the Provincial Antiquities and Picturesque Scenery of Scotland, see Katrina Thomson’s Turner and Sir Walter Scott: The Provincial Antiquities and Picturesque Scenery of Scotland (Edinburgh: National Gallery of Scotland, 1999). 14. Skene, Series of Sketches, pp. 6–7. 15. Walter Scott, The Black Dwarf, ed. by P. D. Garside (Edinburgh: EUP, 1993), p. 132. In his essay on the text, Peter Garside notes that the meeting between Scott and David Ritchie may have in fact occurred in 1796, according to a letter of 16 Oct that year sent to Robert Shortreed. 16. John Martin (ed. ), ‘Advertisement’, in Landscape Illustrations of the Waverley Novels, 2nd edn, 3 vols (London: Charles Tilt, 1832), I, unpaginated. 17. John Martin (ed. ), Landscape Illustrations of the Novels of the Author of Waverley, with Portraits of the Principal Female Characters, 3rd edn, 3 vols (London: Charles Tilt, 1833), I, unpaginated. 18. Skene, Series of Sketches, pp. 5–6. 19. The precise year of this encounter is difficult to ascertain, but it appears that this occurred during the early 1820s, after a particularly difficult attack of illness Scott suffered.